(Nanowerk News) Just when you thought your origami skills couldn’t be beat – try using the world’s thinnest material, making the origami fold and unfold itself, and packing more inside than anyone expected. Researchers from the University of Maryland have done just that. A sheet of carbon atoms folds by applying water along the red lines, then can be used to store hydrogen atoms. Graphene is the world’s thinnest material, just one atom thick. Mechanical engineers Shuze Zhu and Teng Li have found that they can make tiny squares of graphene fold into a box, which will open and close itself in response to an electric charge. A sheet of carbon atoms folds itself into a box that opens and closes as an electric field is applied. 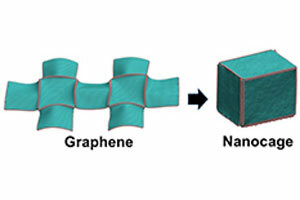 The U.S. National Science Foundation supported the team’s research, which will be published in the journal ACS Nano ("Hydrogenation-Assisted Graphene Origami and Its Application in Programmable Molecular Mass Uptake, Storage, and Release").